ARCADIA -- Saturday further solidified the Arcadia Invitational's reputation as a meet that thrives on setting the stage and then delivering an annual scrambling of the national rankings. 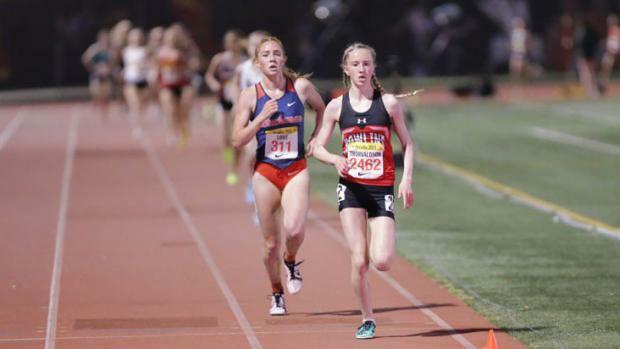 The 59th edition, a two-day festival that concluded Saturday night, included high school athletes from across the United States as well as Canada, Mexico and Norway. Meet management reported that entry requests were received from 730 high schools from 31 states. 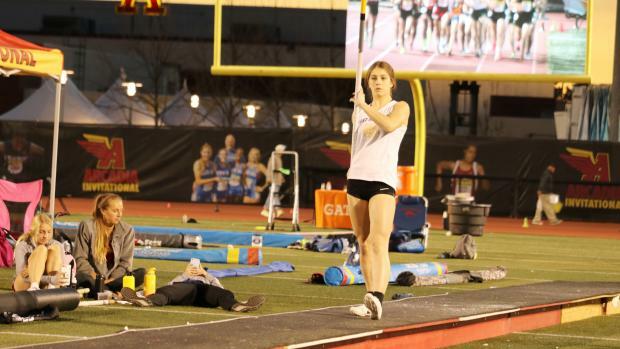 The venerable showcase in the shadows of the San Gabriel Mountains northeast of downtown Los Angeles did its thing in national-record fashion shortly after nightfall when West Seattle (WA) senior Chloe Cunliffe cleared 14 feet, 8 inches in the pole vault. Cunliffe's clearance came on her first attempt after having the bar moved to that height, aware of the significance. Cunliffe's vault into the night sky was one of nearly two dozen marks that scrambled the upper stratosphere of the U.S. rankings. Newbury Park junior Nico Young held off Cole Sprout to win the boys invitational 3200 in a U.S. No. 1 time of 8:40.00. Sprout, from Highlands Ranch (CO) Valor Christian was second in 8:40.73, the two fastest times in Arcadia Invitational history. Young's time in No. 3 in California history. Also in that race, Drew Bosley of Mequon (WI) Homestead ran 8:49.28 for third (U.S. No. 4). The top 14 in that race ran sub-9 minutes, including Gatorade Boys National Cross Country Runner of the Year Liam Anderson (Larkspur (CA) Redwood), who was seventh despite posting a 8:51.89 PR. Previous national leader Matt Strangio (Sacramento (CA) Jesuit), who went 8:47.97 in mid-March, was 15th in 9:00.58. Strangio's March PR from the Dublin Distance Fiesta still ranks U.S. No. 3. The nation's top two times in the boys 400 came out of the invitational race won by Justin Robinson of Hazelwood (MO) West in 46.22. Zachary Larrier, a senior from Elk Grove (CA) Monterey Trail, second in 46.49. Robinson's time ranks No. 4 in meet history. Jasmine Jones (Greater Atlanta (GA) Christian) set the national standard in the girls 100 hurdles running 13.33 with legal 0.5 meters-per-second wind. San Jose (CA) Silver Creek senior Jazlynn Shearer was second in 13.36 for CA No. 1 and U.S. No. 2. And Calabasas sophomore Bella Witt was third in 13.63 for CA No. 2 and U.S. No. 6. Jones' time ranks No. 4 in meet history. Shearer also won the triple jump with a wind-legal best of 41-03.75 (CA No. 1/U.S. No. 2) in a competition where the top four all went beyond 40 feet. There is also a new national leader in the girls 300 hurdles. Leah Phillips of Bullis (MD) is the fourth girl in meet history to dip under 41 seconds with her 40.82 clocking. Anna Hall (Valor Christian, CO) was second in 41.34, U.S. No. 3 and No. 8 in meet history. The girls DMR produced the top seven marks in the country, lead by Mission Viejo. The Diablo gals, anchored by Yale-bound Kelli Hines, came across in 11:47.98, No. 7 in meet history. Hines needed to keep Sacramento St. Francis junior Isabella Fauria at bay. Fauria, who famously reeled in Great Oak's Fatima Cortes during a Friday night relay, wasn't able to do the same to Hines, crossing in 11:51.90. Great Oak, with Cortes on anchor, was third in 11:55.78. The other team running sub-12 in this DMR was Lees Summit West (MO), 11:59.23. During Friday night's relay and distance carnival section, the Cal-bound Cortes, in her first race of the night, put down an epic anchor to rally Great Oak past Mission Viejo to victory in the 4x800. Cortes, known more as a longer distance runner, ran down 800 specialist Ashley Johnson. The Wolfpack's time of 9:10.84 is U.S. No. 1 in a race that produced the nation's top three times and five of the top seven. Calabasas senior De'Anna Nowling, who came in U.S. No. 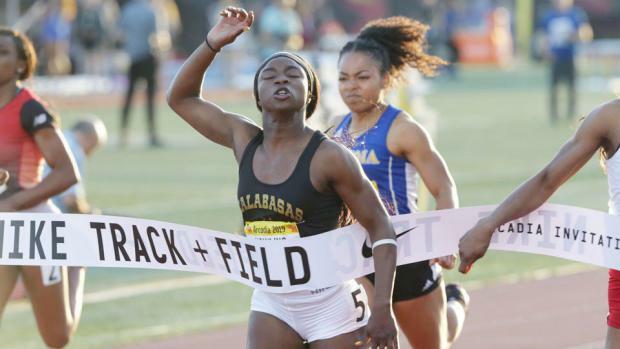 2 in the 100m from her blister 11.43 the week before at the Texas Relays, was a triple winner, anchoring the 4x100 relay team to victory in 46.07 (CA No. 1/U.S. No. 5). Nowling, bound for the University of Miami, then held off Denver (CO) East's Arria Minor to win both the 100 (11.54/0.7) and 200 meter races. Nowling's 200 time 23.64 (-0.9) is CA No. 1 and U.S. No. 8 with Minor's time (23.72) in that race ranking U.S. No. 10. 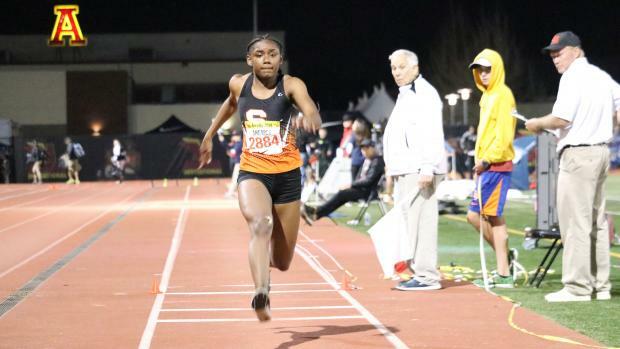 Nowling, the returning CA State Meet champion in the 100 meters, wasn't the only returning CA medal winner with multiple victories Saturday. Coronado senior Alysah Hickey, who medaled at last June's State Finals in the long jump (first) and high jump (fourth) won both at Arcadia. Hickey competed during the day session in the high jump but her winning clearance of 5-9 was the best of the meet. 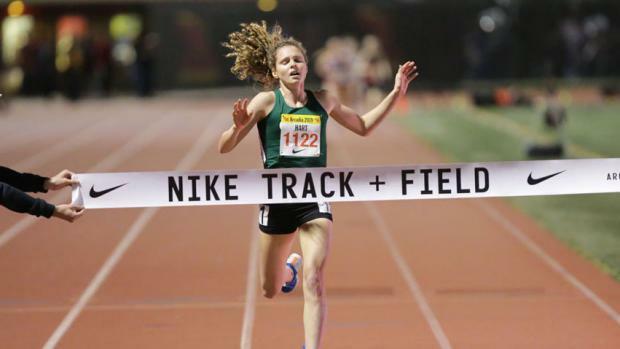 She took three attempts at 5-11.25 going after the San Diego County record. She was close on her second attempt. In the long jump, the Oregon-bound Hickey had to dig deep late just to make the finals, going 19-5.50 on her third attempt. She then took the title on her sixth and final jump, a 19-11.25 (0.0) winner that equals the best wind legal jump in the U.S. this season. Upland freshman Caelyn Harris was second with a wind-legal best of 19-6.50. Harris ranks No. 3 U.S. for her wind-legal 19-11 last week at Trabuco Hills. The top three places in the girls invitational mile all went to sophomores. Carlee Hansen from Woods Cross (UT) won the race in 4:48.31 (U.S. No. 1). Audrey Suarez of Pasadena (CA) Mayfield was second with a U.S. No. 6 time of 4:52.08 and Mia Barnett of Sun Valley (CA) Village Christian -- who trains with Suarez -- was third in 10:53.67 (U.S. No. 10). Another sophomore, Paige Sommers of Westlake (CA) was second to Cunliffe in the girls pole vault with a PR clearance of 13-5, which ranks CA No. 1 and U.S. No. 5 overall and U.S. No. 1 among sophomores. It's also No. 6 in meet history. Rancho Bernardo (CA) sophomore Ashley Callahan cleared 13-4 for third (CA No. 2/U.S. No. 6t/U.S. No. 2 in the class/No. 7 meet history). 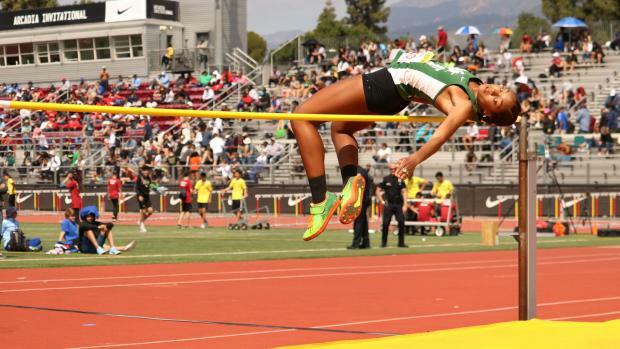 Senior Isabella Grant (Presentation, CA) cleared 13-1, the fourth girl in the competition over 13 feet. 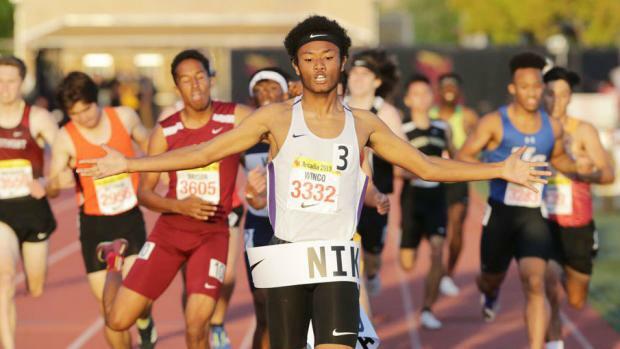 The last time Valencia (CA) senior Kai Wingo was on the track at Arcadia, he won the 600 meter race at the CA Winter Championships. 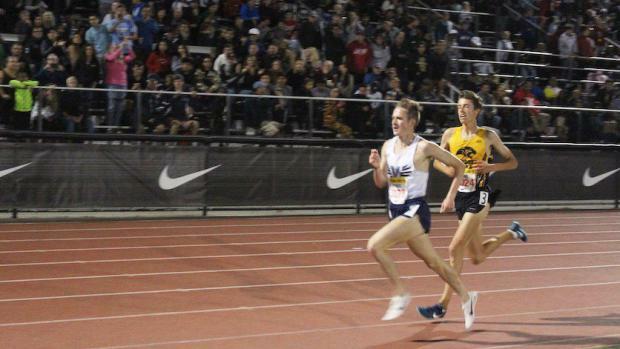 Wingo felt at home Saturday night in winning the boys 800 in 1:52.45 (CA No. 1/U.S. No. 4). Wingo said he blew up his plan during the early part of the race and had to make amends late. Sacramento (CA) Jesuit junior Chase Gordon was second in 1:53.06 (CA No. 3/U.S. No. 9). The boys invitational mile produced the nation's Nos. 4-6 times led by Chase Rivera (Bolles, FL) in 4:11.24. Ryan Stubbs (Campo Verde, AZ) was second in 4:11.72 and Christopher Middleton-Pearson (Dublin, CA) was third in 4:12.48. With senior Mason Ratkovich on anchor, Loyola won the boys distance medley relay in 10:12.05 (CA No. 1/U.S. No. 3). On Friday night, Ratkovich put down a determined anchor to lead the Cubs to victory in the 4x800 with a U.S. No. 2 time of 7:48.13. Clovis North junior Caleb Foster broke the 25-foot barrier in the boys long jump, leaping 25-01.50 (CA No. 1/ U.S. No. 3). The mark was wind legal at 1.2 meters per second and ranks No. 2 in meet history. Foster is only the fourth boy in meet history to exceed 25 feet and the first since Adoree Jackson (Gardena Serra) went 25-00.50 in 2014. Corey Moore of Liberty (NV) won the boys discus with a throw of 200-11 (U.S. No. 4). The big throw, his first beyond 200 feet, came on his sixth and final attempt. His 195-5 from his fourth attempt also would have won the event. 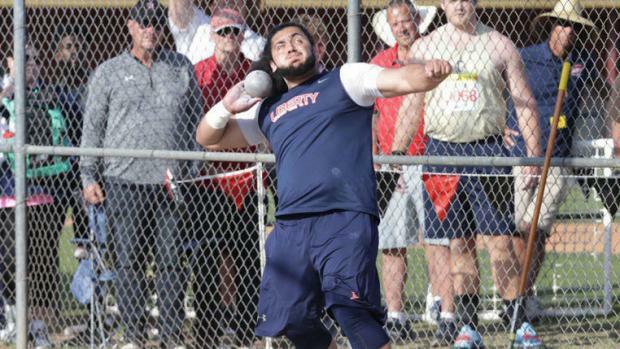 Two returning California State Meet champions won the other throws. 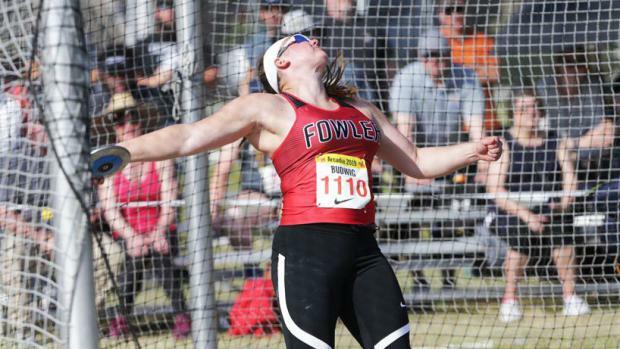 Auburn-bound Jocelynn Budwig of Fowler won both the shot put (46-10.50) and discus throw (171-7), and Mississippi-bound Daniel Viveros of Bakersfield Liberty won the shot put (66-9). None of the marks by Budwig and Viveros -- the returning State Meet champions in the shot put -- surpassed their current nationally ranked standards. West Ranch (CA) senior Natalie Ramirez, Budwig, and Bakersfield (CA) Liberty sophomore Faith Bender rank 2-3-4 nationally in the shot put and Budwig, Bender, Ramirez is the 1-2-3 U.S. rankings order in the discus throw. At Arcadia, Ramirez was second (45-4) and Bender third (45-3.25) in the shot. Bender was second (163-10), Carly Watts of Terra Nova (CA) -- with a U.S. No. 6 throw of 157-4 -- was third, and Ramirez (151-1) was fifth in the discus throw. Aaliyah Soa of Liberty (NV) was fourth in the discus throw (156-7, U.S. No. 8). Viveros, who has a national-leading shot put of 68-11, hit his winning throw on his sixth and final attempt, although his second and third attempts -- 65-11.75 and 66-5 -- both exceeded the best of runner-up Tanner Duffin of St. Pius X (GA) who hit 65-11.25 on his fourth throw. Duffin also placed second to Moore in the discus throw. His mark of 194-2 ranks U.S. No. 6. Viveros came back to place fourth in the discus throw with a 187-7 PR that ranks U.S. No. 15. In the shot, where Viveros' 66-9 ranks sixth in meet history, he has displayed consistent growth so far this season. Arcadia is the fifth time in the last six meets where he has exceeded 65 feet. He entered the season with a PR of 63-10.25 and won the State Meet title at 62-5.50. This was his second time beyond 66 following his U.S. No. 1 throw of 68-11 from the March 23 Santa Barbara Easter Relays. ... Sydney Thorvaldson of Rawlins (WY) matched Hart's early breakaway, albeit some 10 meters-plus behind. While Hart pushed the pace well out front, Thorvaldson ran solo in a vacuum between the runaway leader and the pack. That's how it remained to the end with Thorvaldson finishing in Hart's vapor trail in a big 10:12.18 PR and just ahead of a surging Meagen Lowe of Clovis (CA) Buchanan. The race was essentially how fast would Hart go and who would emerge from the pack behind Thorvaldson. Lowe, La Costa Canyon's Kristin Fahy and Healdsburg (CA) senior Gabrielle Peterson did a lot of the early work up front before. Peterson faded and Fahy and Lowe led the 30-runner parade. Two weeks before, this duo battled at the APU Meet of Champions with Lowe challenging over the final 300 but Fahy countering and pulling away to victory. Here, it was Lowe who kicked late without a Fahy response. Lowe's 10:12.78 for third is a massive PR. Fahy's 10:15.80 was good for U.S. No. 4 and a San Diego Section record. Newbury Park freshman Colin Sahlman won the boys Rising Stars Mile in 4:16.44, breaking the meet record of 4:17.48 previously held by Jack Yearian (Bellarmine Prep) in 2014. In running the fastest mile in the U.S. in the class of 2022 and No. 13 U.S. overall, Sahlman set the pace for a fast race among the young stars that was faster at the top than the open division. Camas (WA) sophomore Sam Geiger was second (4:16.58) followed by Star Valley (WY) sophomore Peter Visser (4:17.18) and Bellarmine (CA) sophomore Colin Peattie (4:18.31). For comparison, Hart (CA) senior Jeremiah Rasmussen won the boys open division mile in 4:18.84 with Dougherty Valley senior Lucas Badcock second in 4:19.07. Overall, Sahlman's time was the ninth fastest of the meet. Long Beach Poly team of DeAngelo Chester, Kenyon Reed, Kejuan Markham and Anthony Johnson won the 4x200 relay in 1:25.91, a U.S. No. 8 time that ranks No 3 all-time at Arcadia. 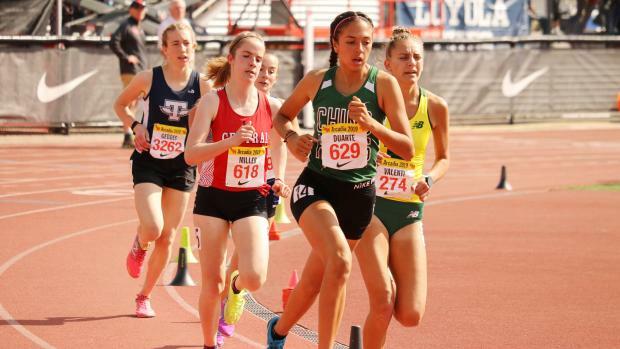 Chino Hills (CA) sophomore Jacqueline Duarte, third at the State Meet as a freshman in the 1600, is rounding back into form this season. The combo distance runner-soccer player didn't have a fastest enough qualifying time to get her into the Saturday night elite race and she was relegated to the morning section in the girls mile. Duarte showed why she was the fastest freshman in the nation at that distance last season, running 4:55.19 to win them mile, out-sprinting Ellie Hall of Marietta (GA) down the home stretch. Hall finished in (4:57.45). Mattalyn Geddes of Twin Falls (ID) was third in 4:59.94. Duarte's time ranks U.S. No. 14/U.S. No. 5 in the class of 2021. 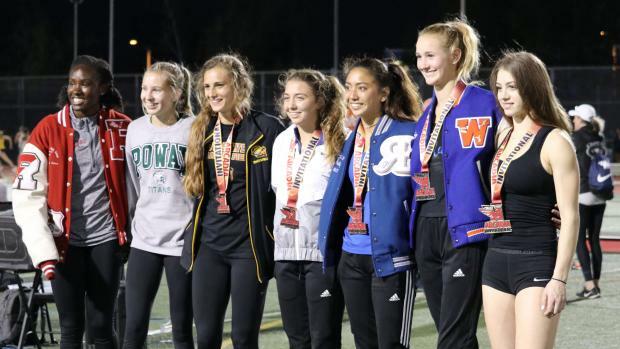 In the day girls 800 meters, Anaheim Canyon freshman Emma Hadley ran 2:13.01, the fastest time by a freshman in the U.S. Mountain View (CA) St. Francis sophomore Isabelle Cairns (2:13.27), Lakes (IL) Community junior Olivia Schmitt (2:13.83) and Chicago (IL) Latin School sophomore Marianne Mihas (2:13.91) also posted sub 2:14 times. Photos by Zoe Medranda, Frank Bellino and Jeffrey Parenti.